I heart mascara. It's one of those products that, if you only have about one minute available for makeup time, really transforms your whole face in the blink of an eye. (Pardon the pun.) 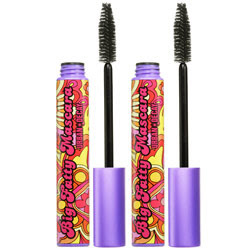 So is there anything better than Urban Decay's Big Fatty Mascara? The bottle alone just screams for you to try it -- it's vibrant, it's loud and it's fun to look at. This baby vows to create lashes that are full, fat, plump and long ... and it's even infused with hemp oil for moisturizing properties. So, with all that being said, this beauty chick is super-excited about the Big Fatty Mascara Duo that's just perfect for Two-For Tuesdays! Whether you want to keep both tubes for yourself or share with your BFF, this deal is too sweet to pass up. While one tube retails for $19, you can get both for only $29 on Sephora's website! The word "fat" never looked so good.